Struggling to haul in a giant fish, Lorenzo Mitchell Henry finally reeled in a record-breaker, which weighed in at a mammoth 851lb (386kg). This monstrous beast, an Atlantic bluefin tuna, was not caught by the amateur angler off some far-flung shore, but near the coast of the very English town of Scarborough. Until the 1950s, fishing for the Atlantic bluefin - known then as the tunny - was big sport in England and scenes similar to those pictured above were commonplace. By the end of the decade, the tunny was rarely found in British waters - but is big-game fishing on the verge of making a comeback? In the 1930s the rich and famous flocked to Scarborough, a resort town on the Yorkshire coast, for the chance to catch the prized tunny. Lorenzo Mitchell Henry, a pioneering big-game fisher, was the pursuit's poster boy. The son of a wealthy Liberal MP, the Old Etonian discovered tunny fishing while living in Canada, according to an account of his family history. It details how he fished and shot his way around the globe, living in Germany and the United States, before returning to England after World War One. 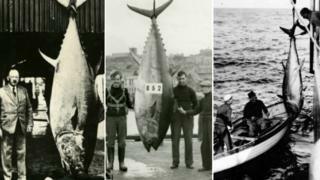 From Canada he brought new knowledge of how to catch these giant tuna, landing the first in Europe off Norway, his son wrote. Tunny fishing, Lorenzo Mitchell Henry wrote in The Times in 1933, was governed by strict rules - such as only one angler being allowed to fight a single fish, which "must not be hand-lined, harpooned or shot". The same year as his letter in The Times, he defeated the 851lb tunny after a three-hour battle. It remains the largest caught in British waters - about 4,000 cans' worth. Despite the difficulties associated with hauling the gigantic fish out of the water, there were regular tunny hauls off the Yorkshire coast until the 1950s. Catches then began to decline dramatically, with the last landing reported off Scarborough in 1954. The fish would still occasionally be caught around the UK after this, but by the 1990s they had all but disappeared. Dr David Righton, who has studied the bluefin's behaviour, believes declining herring stocks in the North Sea from the end of the 1940s could have been one of the factors in the demise of the tuna off the British coast - herring was a source of food for the tunny. "At the same time that herring was being overfished, tuna were also becoming a valued target for fisheries elsewhere in Europe, so it could have been that tuna numbers were, like herring, reduced." Today, British big-game anglers are used to travelling the world to have the kind of experiences Lorenzo Mitchell Henry enjoyed off the Yorkshire coast. 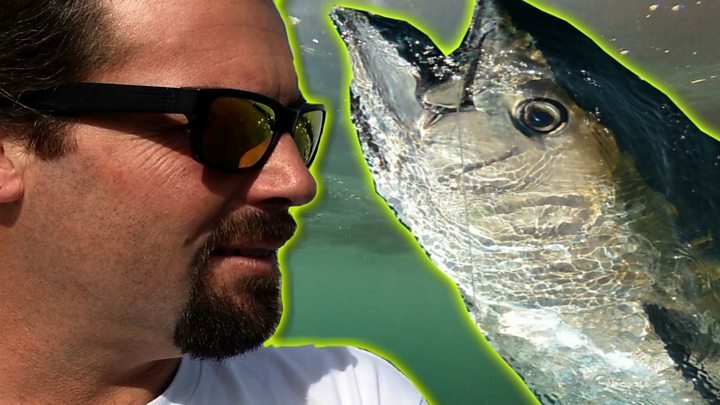 So when Rik Le Ray hooked an Atlantic bluefin in Guernsey waters, he was extremely excited. Mr Le Ray, who had been out shark fishing, battled the giant fish on rod and line for four hours, before releasing the 500lb (227kg) beast back into the sea, alive. It was the highlight of 30 years of sport fishing for the exhausted but ecstatic angler. "When you actually hook up to these fish it's mind-blowing - the power and the speed and stamina of the fish is just something else. "It's brutal, it really is brutal - nothing really prepares you for it until you've done it." It is a bit of a grey area as to whether Mr Le Ray, an amateur angler, was allowed to catch the bluefin in Guernsey waters. In UK waters the rules are clear - targeting the tuna is not allowed. "I had no desire to kill it whatsoever," says Mr Le Ray of his giant catch. "We use special hooks, [so] that we can release these fish unharmed. "I haven't got any interest in taking one of these fish. "I'd much rather see them swim away - enjoy the battle with the fish, and let them swim away at the end of the day. "They're worth far more alive than they are dead." The Atlantic bluefin is endangered globally, but is now being seen more frequently in British waters, with the Angling Trust estimating there have been "hundreds" of sightings annually in recent years. David Mitchell, head of marine at the trust, says the fish are mainly being spotted off the southwest of England and the Channel Islands. "The sightings have gone from almost nothing, to regular sightings from people who are on the water, or people who are at the coast and able to see these feeding frenzies. "They are predominantly around the South West and some key areas, which I believe are Mounts Bay in Cornwall and Falmouth Bay." The fish are also being caught off west Wales, he says. Dr Righton, from the Centre for Environment, Fisheries and Aquaculture Science, is trying to find out why the tuna is returning to British waters. He is part of Thunnus UK, a two-year tagging project with the aim of understanding the tuna's recovery. One possible factor is the resurgence of the fish on which the tunny preys, such as the sardine and the sprat, he says. "It could be that these fish have attracted tuna back into UK waters, or in a reverse of the decline in tuna after the 1960s, it could be that stocks have recovered a little, and migration patterns are beginning to change again, or that environmental conditions have become more favourable. "These are huge, exciting, top predators, yet with an uncertain future," Dr Righton says. Despite that uncertainty, some groups are already calling for fishers to be allowed to catch tuna in British waters. The Angling Trust says if the fish do go on to re-establish themselves, a catch-and-release fishery could be a prospect for south Cornwall. In its submission to the UK government ahead of the publication of a White Paper on sustainable fisheries, the trust put forward a vision for Cornwall in 2028 which envisioned swathes of new guesthouses, hotels and restaurants. They would serve visiting bluefin anglers during the tuna-fishing season, between late summer and early winter. "There's a huge potential for parts of the South West which are currently suffering from a lack of investment, high levels of deprivation, and a lack of industry and employment opportunities to reinvent themselves as sport angling hotspots," Mr Mitchell says. He points to Canadian research, which suggests live-released tuna have the potential to generate six times more revenue than commercially caught fish. For that to happen amateur anglers must be allowed to target bluefin tuna, something both they and commercial fishers cannot do at the moment. But Mr Mitchell believes Brexit might present an opportunity. Through its European Union membership, the UK is signed up to the International Commission for the Conservation of Atlantic Tuna (ICCAT), the body that decides how much of the fish countries can catch. Outside of the EU, the UK would be able to apply for a quota independently and without having to argue with EU countries such as Spain, France and Italy for a slice of the pie. "At that point we can apply for a quota, and at that point we can allocate it to recreational fishing and have a legitimised sport fishery," Mr Mitchell says. It is something the UK government did not commit to in its recent White Paper, but it did recognise the economic and social benefits of recreational angling. However, Greenpeace has long campaigned for greater tuna conservation measures, and for the environmental charity the suggestion of anglers being able to target tuna has come too soon. "Just a few years ago, bluefin was on the brink of collapse," says Will McCallum, head of oceans at Greenpeace UK. "Any decision to allow fishing for it, or potentially harming it by catching and releasing it, would have to be based on rigorous research regarding the true state of its recovery." But supporters of catch-and-release point to studies showing fewer than 5% of released fish die - it is even the method used to tag the fish to understand their behaviour better. For many in coastal communities across the British Isles, the return of the mighty tuna has been a welcome sight. With it comes the prospect of once again seeing the tussle between man and fish made famous by Lorenzo Mitchell Henry back in 1933. But a better understanding of why these giant fish are back, in what numbers, and whether they are here to stay, is a fishy conundrum that needs to be solved first.